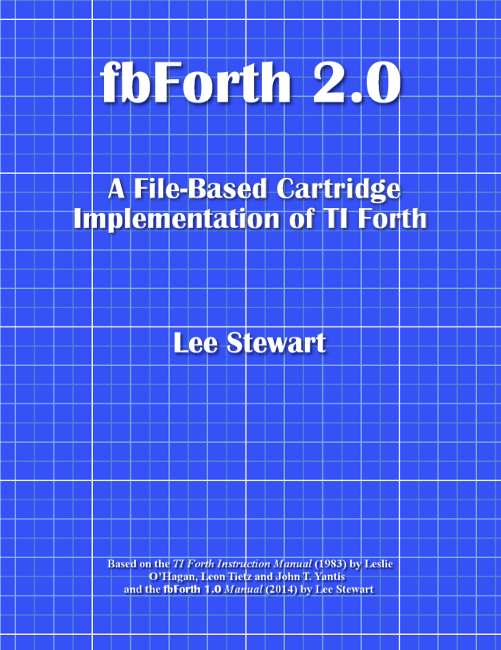 Only the latest versions of fbForth 2.0 software files are posted here. If you need older versions, send me a message through the CONTACT tab at the left. You can run fbForth 2.0 in emulator software by several authors with the binaries included in the packages below. You can also make your own cartridge to run on a TI-99/4A with several circuit boards available in the online TI community and by burning an EPROM with the appropriate binary from one of the packages below. In addition to the 32 KiB cartridge binary, the following ZIP file contains, the BinPack files (described below) and the system files (including FBLOCKS, FBFONT and other useful blocks and font files). In addition to the required RPK file, containing the 32 KiB cartridge binary and and layout XML, the following ZIP file contains the BinPack files (described below) and the system files (including FBLOCKS, FBFONT and other useful blocks and font files). This ZIP file contains the four individual 8 KiB binaries for banks 0 – 4, which can be patched together in 32, 64, 128, 256 and 512 KiB binaries in normal or inverted bank order by the included fbForthBinPack batch file. A readme file is also included.